1 - 48" x 120" sheet. Trim to fit. 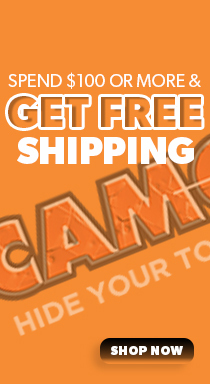 Show your love for the outdoors on your ATV with the Camowraps® ATV Kit in your favorite camo. This easy-to-use kit is designed to cover the outside plastic body panels from the smallest ATVs to the large Big Boy's. Kit includes (1) 48" x 120" sheet. Matte finish. NECESSARY TOOLS: Mild Soap & Water Mixture, Silicone/Wax Solvent, & Alcohol - to clean the surface completely. The first step in any successful application is cleaning your ATV completely before installation. Using two cloths (one dry, one with Silicone/Wax Solvent to remove wax, grease, gas residue, etc.) one in each hand, wipe the solvent on with the wet towel and then quickly wipe off with the dry one. This is to keep the solvent from drying onto the ATV surface. Once completed with the solvent, the last step is to wipe the entire body with the Alcohol using the same two hand, two cloth method used before.Inspect the body’s plastic parts for anything that could hinder the installation such as scratches or burs that extrude from the surface. Try shaving them as flush as possible with a razor blade. 3M94 Primer can be used in the concave and recessed areas to help increase the adhesion properties of the vinyl, however this is not required for installation of Camowraps® ATV Kit. Now you are ready to install your Camowraps® ATV Kit. 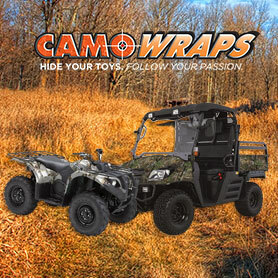 Always start your wrap from the back forward to keep the wind from driving the vehicle from picking up the graphic and removing your Camowraps® ATV Camo Graphics. Think of your ATV in 4 Sections, (Front or Hood area, Gas Tank, Back, and Additional Side Area) this will help you with measuring your pieces to fit each area more effectively. To apply the Camowraps® ATV Kit to the ATV, peel back the adhesive liner several inches and align Camouflage piece and tack in place using light finger pressure. If alignment is off, remove and reposition before squeegeeing. Once tacked in place and the alignment is good, use the palm of your hand to push vinyl into place on all the raised areas of the ATV. After the camouflage is tacked into place, firmly squeegee the Camouflage Vinyl to the ATV working out any excess air or bubbles. If a bubble appears, simply use an air release tool to poke and release the trapped air. Make sure to come back and re-squeegee the poked hole with light to moderate pressure and re-heat if necessary. Continue using these techniques throughout the entire installation until the ATV is completely covered in the Camowraps® ATV Kit. When application is complete, re-heat and re-squeegee all of the applied surfaces with firm pressure, paying particular attention to the edges and seams. This will ensure the Camowraps® is bonded to the ATV itself. HOW TO REMOVE: In order to remove the Camowraps® ATV Kit you may have to Heat the Camouflage Vinyl with a Heat Gun or Hair Dryer for several seconds to loosen the adhesive bond, then peel the material from the surface on a 120° Angle. Any residue that may be left behind can be removed with a Citrus Based remover or Alcohol.